Now this would definetly be something very illegal in most countries – but non the less it’s a great product. After all, the cops has to see that you have it before they can arrest you for it, but as it’s visible from ‘normal’ angles that shouldn’t happen. A quote on their website states: This product may not be legal in some cities or states. The buyer assumes all responsibility for using this product in compliance with local motor vehicle codes. It’s a thin film that you stick in front of your license plate which will only be visible when viewed from a straight angle or a slight angle. If you look at it from the side or from above (where cameras are usually located) the you won’t see anything. The film is $27.99 for US plates and $39.99 for international customers. If you need to have one for outside the US then your film will be made to your own countries specifications. The Super Protector is your defense against the red light camera and the speed camera. It is a cover for your license plate that makes the numbers on your license plate(s) unreadable by a photo radar or red light camera. When you view the license plate straight on, the numbers are perfectly readable, but from the angle of the speed camera or red light camera, the numbers can not be seen. Japanese company Matsushita has released a wake-up light that gradually brightens at 30 minutes before a set time. That in itself is nothing new, but the lamp also makes bird-chirping sounds two minutes prior to the alarm time, rendering horrific, shrieking demon birds in your dreams. If that â€œchirp chirpâ€? is too cheesy for you, you can opt for a slightly less cheeky version and set it to wake you with a â€œmelody that blends the sounds of a music box and tinkling glass.â€? , I can understand her frustration. 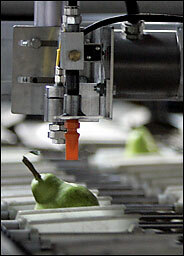 My robot vs Your robot? One of the largest robotic happenings in the world starts today in Osaka, Japan. Now this is really something that would be worth seeing, especially as it is expected to have around 120.000 visitors this year. Last year in Lissbon only 2.000 visitors came. 330 teams from 31 countries will compete in 10 different classes, 7 senior and 3 junior. They will compete in among other things football and search and rescue. On top of this there will of course be a lot of different robots on display. A sink is a sink, but not when it has LEDs. Then itâ€™s a Super Sink. This Hansa tap has LEDs that light up in response to the water temperature. Blue is for cold, red is for hot, and white is for plasma. The image shows them looking like blood and toilet water, respectively, but I suppose this sort of LED water UI can help those with no nerve endings in their hands. Now this is just excellent. 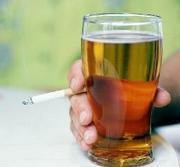 A German brewer has created a frosty lager for smoking cessation. Each can contains 6.3 percent alcohol by volume and drinking three cans of the stuff, called NicoShot, is equivalent to smoking a pack of cigarettes. I think the implications are obvious: smoking makes you skinny and beer makes you fat. So if you add the two together, you get to your ideal weight. 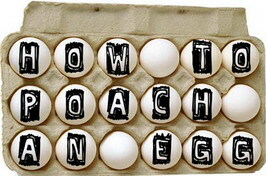 Eggs in all honour, they’re lovely – but not poached!? At least that is the opinion of many people as they’ve had an ‘bad poach experience’ in the past or are simply revolted by the looks of one. Rob, an egg lover, were of the same opinion but decided to give it another shot – with Google in one hand and the fryingpan in the other? I love eggs. Scrambled, soft boiled, hard-boiled, fried, or an omelette, I’ve yet to find a way of serving an egg that I didn’t fundamentally think was wonderful. And yet I haven’t eaten a poached egg in 15 years. Why? Fear. Fear of getting it wrong. Fear of “stringy egg soup”. Fear of stinky vinegar stinking up the house. And to google I go, and of course there is a thousand and one bloody sites. And guess what? It’s a hotbed of conflicting advice. Every chef has a different method. I’m confused, I don’t want choice – I want results. You just got to admire where Google came from and what it is today. I mean, it can ever guide you in the right direction when you spell something wrong. That’s a good thing! It’s just a shame that people making websites doesn’t spell check their work before publishing – something that a misspelled search on ‘Deaf and hard of hearing’ will show you. Go ahead and try it here. I’m the last person to fall for a cellphone, and I’m still running around with my phone from 4 years ago (Nokia 6310) as my true partner. 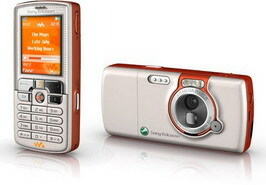 But I must say it – the new SonyEricsson w800 is veeery nice. It doesn’t look like a toy, the camera actually looks like a camera, it’s a Walkman (yes a Walkman, that’s how SonyEricsson has branded it! ), and it’s Orange!!! Over at Bengalboy they’ve managed to get their hands on one and made a full review over it.